Thisis a hot air gun. 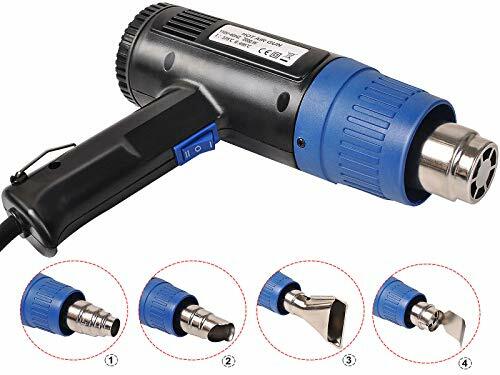 This specially designed heat gun (hot air) produces a jet of hot air that softens the parts to be joined. Hot air/gas welding is a common fabrication technique for manufacturing smaller items. It can be used for melting materials, softening paint and plastic, removing the sticker, bending the plastic tube, changing the floor tile, repairing the mobile phone and so on. Temperature Adjustable: Unique variable temperature mode design allows it to select the appropriate temperature mode according to the specific operating requirements. 4 Nozzles: It is equipped with 4 different nozzles, which can be selected according to different needs and can meet different operating characteristics. High-Performance: Hot air/gas welding is a common fabrication technique for manufacturing smaller items，you can use it easily. High Quality: It is made of high quality materials, which ensures that it can be used for a long time and can't be damaged easily. Widely Used: It can be used for melting materials, softening paint and plastic, removing the sticker, bending the plastic tube, changing the floor tile, repairing the mobile phone and so on.